For sale we offer the cobalt xf chrome 8 millimeter diamond cut Newport wedding band which is a handsome masculine looking men's wedding ring. 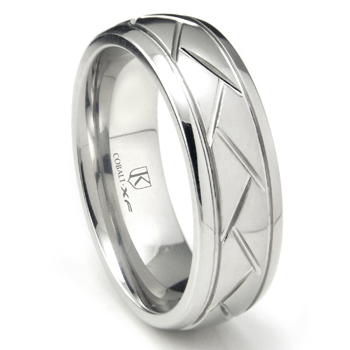 Our Cobalt chrome wedding rings are extremely hypoallergenic metal used for years in medical implements. This metal is just as white as platinum or white gold and is much more durable. When cobalt and chrome are combined it creates a very strong metal bond. The ring is 8 millimeters wide and found in various sizes. If you need help with the size to order contact us so we can deliver the right size ring. Our cobalt xf chrome 8 millimeter diamond cut Newport wedding band is the perfect matching wedding band for couples who need to match a white gold or platinum wedding ring worn by the bride. Our cobalt chrome wedding bands are affordable for budgets large and small. All of the TitaniumKay.com jewelry offered for sale is backed by a 100% lifetime warranty including rings with engravings or gemstones. Looks fantastic and very affordable. Saw the same stlye rings for 3 to 4 times the price. At these prices I will buy a few more rings for sure.